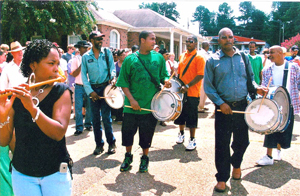 The legendary Rising Star Drum and Fife Band founded by the late Otha Turner and led by his granddaughter Shardee Turner (left) marches in procession down Main Street in Como , Miss. , Saturday to unveil the Mississippi Blues Trail marker honoring his contributions to American music. The procession followed a program honoring Turner featuring music by Jimbo Mathus and talks by Turner friends and relatives including bluesman Kenny Brown, blues historian Scott Barretta, and Como Mayor Judy Sumner. The band has performed at every Sunflower River Blues and Gospel Festival in Clarksdale , Miss. , since it was founded in 1988. Turner and his daughter, Bernice, died on the same day in 2003, and the 2003 Sunflower River Festival was dedicated in their memory. 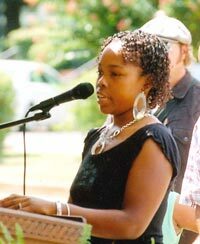 Shardee Turner, granddaughter and protégé of Otha Turner, talks about the Turner family before playing keyboard and performing her composition, O.T., honoring the late musician. More than 200 including the Turner family (pictured) applauded the unveiling of the Mississippi Blues Trail marker in Como, Miss., Saturday honoring the late Otha Turner, founder of the Rising Star Drum and Fife Band. Since Turner's death in 2003, the band has been led by his granddaughter, Shardee (center) who was 13 when her granfather died.